Constable & Phillips is a family business owned and run by Peter and Elaine Boyson. Our company was founded in 1979 by John Constable and Derek Phillips, both skilled cabinet makers, with a wealth of experience. Although since retired, the high standards that they set are evident in the furniture that we make today. Peter Boyson joined in 1981 as designer and project manager and became a Director in 1986. The management team including Steve Boyson and Paul Higgins are there to ensure that we maintain the high standards that clients have come to expect from Constable & Phillips. We make all of our furniture in house. We source modern materials and the finest quality timbers from around the world from suppliers who are FSC certified, promoting responsible management of the world’s forests. When you visit our showroom you will see examples of the furniture that we make by hand in our factory. 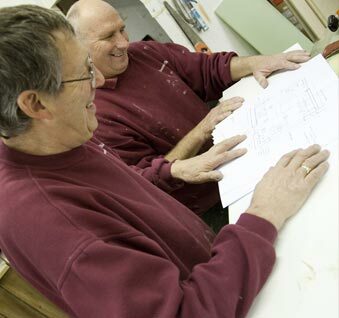 We use traditional cabinet making skills and modern machinery required for bespoke furniture production. We make our dovetailed wooden drawers from the same wood that you choose for your door and drawer fronts. Everything is finished in our spray shop with durable lacquers and paints. We have a large showroom with many kitchens on display and built in appliances from Siemens, Bosch, Scholtès and Britannia and work surfaces in granite, Corian, Silestone and various woods, walnut, iroko, maple and oak for example. We also display sinks and taps by Franke. As well as bathroom displays by Sottini with Hansgrohe and Matki showers, with a good selection of ceramic, porcelain and natural stone tiles to compliment. with you. We can go through different ideas with you and discuss specific design and Installation requirements, project timescales and budget costings. For most people the next step is for us to visit your home and undertake a detailed survey and take accurate measurements. It is important for us to listen to and understand your ideas and we can use our experience to advise and offer designs and products to suit your needs. We will then prepare designs with hand drawn plans and colour CAD drawings to show you at the next meeting back at our showroom. At this point we will have detailed costings to show you. We will then be able to focus on the fine details and you will be able to choose finishes, colours, handles and accessories etc. 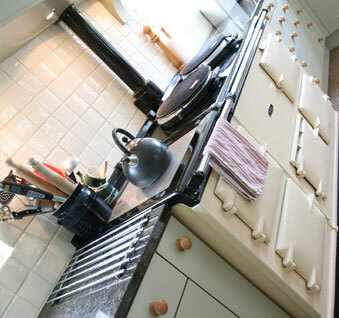 We can then project manage the whole installation or manufacture and supply only for your own contractors to install. We project manage the whole process from the design stage through ordering and manufacturing to the installation and timely completion of the project. We can undertake all aspects of the work including electrics, plumbing, tiling, heating, minor building works and decorating. If you are having an extension or a new house built we can liaise with your building contractor and prepare electrical, lighting and plumbing plans for them to use. We have been serving our clients for over 30 years.Many of our clients come back to us time and again to help them out with different projects throughout the house or if they move to a new home.You will have the peace of mind knowing that you are dealing with an established company that has thousands of satisfied clients. We take pride in the personal friendly service we offer always with careful attention to detail. We would like to thank those clients who have given their permission for us to use pictures of the work that we have done for them on this web site and we hope that you are inspired to visit us, you will be made most welcome.